Seller Superrfloyd96 assumes all responsibility for the listing and deleting of this ad. 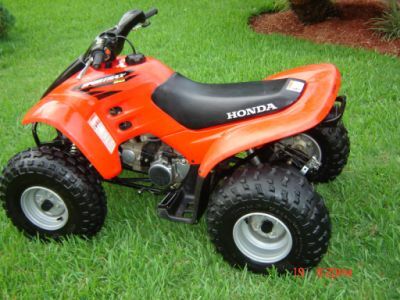 2004 HONDA SPORTRAX 90 ATV. EXCELLENT CONDITION. BOUGHT NEW 18 MONTHS AGO. MY CHILD HAS OUTGROWN IT AND MOVED UP TO A BIGGER ONE. HAS BEEN RIDDEN FOR LESS THAN 50 MILES. RUNS PERFECT. THIS IS A GENUINE, DEPENDABLE HONDA-NOT A CHINESE PIECE OF JUNK THAT YOU CANT GET PARTS FOR! PRICE IS 1600.00, CALL ME AT 832-465-2456 AFTER 6PM.